The NJDOT Bureau of Transportation Data and Safety (BTDS) is responsible for administering the Federal Highway Administration’s (FHWA) mandated annual Highway Performance Monitoring System (HPMS) reporting. The Traffic and Technology Section (TTS) of the BTDS supports the HPMS reporting by administering a Traffic Monitoring Program that includes a combination of continuous and short-term traffic data collection efforts. In addition to the approximately 150 state-wide continuous count sites, the TTS also uses consultants to count in excess of 1,800 short-term sites per year and 650 ramp sites per year. 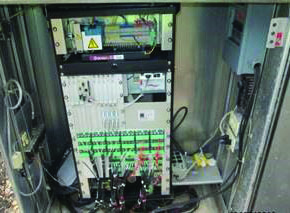 The continuous count program includes the data downloading, data processing, and routine maintenance of the Weigh-in-Motion (WIM) and Traffic Volume Station (TVS) sites. The WIM and TVS sites in New Jersey are located on various types of roadway classifications ranging from Urban Interstates to Rural County Roads. WIM sites collect vehicular data such as volume, classification, weight, and speed. TVS sites collect volume data only. Both types of site’s data are reported to FHWA and can be located on the NJDOT website. Through the Innovative Concepts portion of the Traffic Monitoring Program contract, the TTS worked hand-in-hand with a consultant to develop an interactive website solely dedicated to NJDOT WIM information. This website enables any user to view New Jersey WIM statistics graphically, as well as having the ability to download data to fit their needs or requests. Users can see statistics such as overall volumes for the state by Class, entering/exiting volumes at WIM sites near New Jersey borders, and traffic information by lane and by hour for a specific WIM site just to name a few. Currently, the TTS is responsible for 95 WIM sites state-wide. 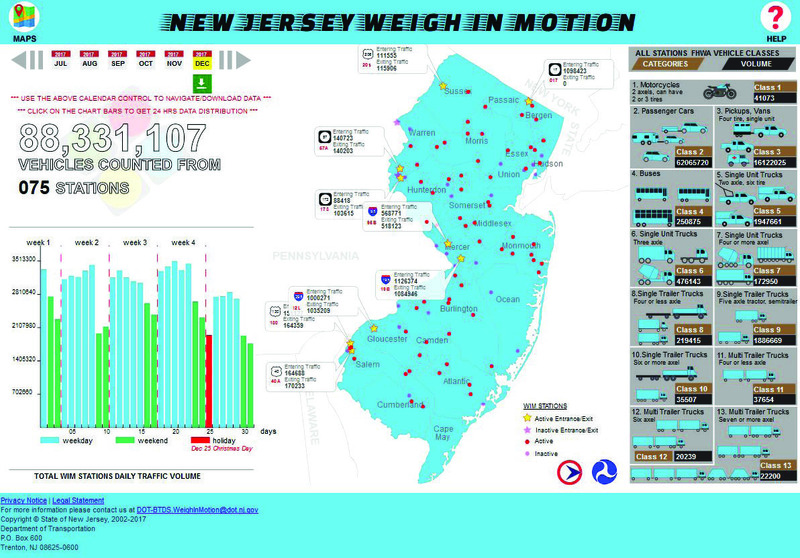 Although the latest historical data is available through an interactive map located on the NJDOT website, it is cluttered with the entire Traffic Monitoring Program Counts and only shows the latest couple years of data for any WIM site. In addition, any request for specific WIM data from the public or within NJDOT would have to be processed by in-house TTS staff. The New Jersey WIM website was just recently launched and can be found on the NJDOT website. Early feedback has been extremely positive and has allowed TTS staff to drastically reduce the data processing task for recent requests by directing requestors to the website. Additionally, it enables the TTS data publication to reach a wider and more diverse audience. This article first appeared in the June 2018 CIPGA SCOOP, the employee newsletter of Planning, Multimodal and Grant Administration. Posted in News and tagged Weigh in Motion.